Left to right: Director Kevin Kölsch, John Lithgow, Director Dennis Widmyer behind the scenes on the set of ‘PET SEMATARY,’ from Paramount Pictures. AUSTIN – The 2019 rebirth of Stephen King’s acclaimed novel PET SEMATARY, starring Jason Clarke and Amy Seimetz, closed the South by Southwest Film Festival on March 16. The Paramount Theatre was packed to the brim and audiences were eager to get a taste of the latest film in the King-aissance, as it’s being coined. Since 2017’s IT, we have seen more and more filmmakers putting a modern and darker twist on King’s work for the big and small screen. Filmmaker Mike Flanagan, who has been riding a major wave of success lately since casting Netflix’s THE HAUNTING OF HILL HOUSE out into the world, directed King’s GERARLD’S GAME and is currently set to release King’s follow-up to THE SHINING, titled DOCTOR SLEEP, this fall. Not to mention 1922 (that released on Netflix in 2017) and IT: CHAPTER 2 (hitting theaters in early September). So, obviously we’re in full swing of the King, and PET SEMATARY knocks it out of the park. In my SXSW review (which you can find here), I compared a lot of the film’s terror to Stanley Kubrick’s THE SHINING. 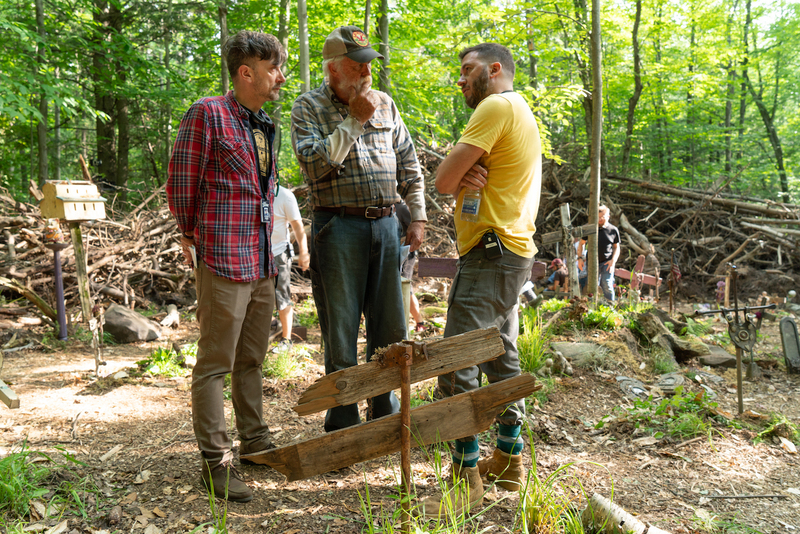 The way PET SEMATARY directors Kevin Kölsch and Dennis Widmyer (STARRY EYES) blur the lines of fantasy and reality in the film, while also building an intense amount of dread throughout, it’s easy to equate the two. The story and how the characters are handled also feel much fuller compared to the 1989 film adaptation, like an acoustic performance compared to an orchestra. For fans of the King’s novel and/or the 1989 film, you will be surprised by Kölsch and Widmyer’s direction. The story concerns Louis and Rachel Creed (Jason Clarke and Amy Seimetz), who move from the big city to a small rural town in Maine for a fresh start with their two children, Ellie (Jeté Laurence) and Gage (portrayed by twins Hugo and Lucas Lavoie). After settling in, they discover there’s a pet cemetery (or “pet samatary,” as a handmade wooden sign indicates) on their property. Slowly it is revealed that beyond the cemetery is sour ground with the power to resurrect the dead. What may seem like a route to cheat death has deadly consequences. Fresh Fiction sat down with directors Kevin Kölsch and Dennis Widmyer and stars Jason Clarke and Amy Seimetz at SXSW to discuss the film. We talk about making the experience fun for fans of the original text and film, the lessons they learned from being a part of it, as well as how the film managed to even scare them. Paramount Pictures will release PET SEMATARY nationwide on April 5, 2019. Special thanks to Paramount Pictures for making this interview and experience possible. They provided the camera crew and setup at SXSW.